Why do clutch bell bearings wear faster than wheel bearings? What forces is a clutch bell bearing enduring? How often should I change a clutch bell bearing? Wheel / diff bearings operate under different loads to clutch bearings, wheel / diff bearings are housed firmly within the diff / hub. The outer ring does not spin or undergo centrifugal forces. There is very little instantaneous acceleration or stopping, most is gradual compared to a clutch bell. The speed is much lower due to the gear ratio’s. Calculations based on the RPM / ratios of my own buggy (Tekno NB48.3), have shown that when the engine is Revving at 30,000 RPM the Centre diff and front/rear diff pinions are spinning at 9,772 RPM. The Diff outdrives and wheel bearings are spinning at 2,443 RPM, the car is travelling at approximately 50km/h. The Wheel bearings are spinning at only 8% the speed of the engine / clutch bearings. A clutch bell bearing is housed within the clutch bell, which spins at different speeds depending on the speed of the car and engine. The outer ring of the bearing and the speed of the clutch bell, are always the same, and are directly in ratio with the speed of the diffs / wheels. If the wheels stop, the bell stops, the clutch disengages and the engine continues to run. The inner ring of the bearing is spinning directly with the RPM of the engine, when you are accelerating, the bearing is not spinning internally, the balls are stationary because the clutch is engaged. The engine and wheels are accelerating according to the ratio of the diffs etc. When the car stops accelerating (braking for a corner), the clutch disengages and the inner ring of the bearing goes from 0 RPM to the RPM of the engine which is decelerating, but the outer ring is going at the speed of the wheels. It’s a bit to get your head around but imagine how often your clutch bell bearings go from not spinning, to spinning at 30,000+ RPM in an instant, in a simple blip of the throttle the clutch engages, the bearing stops but then it spins up again immediately. Another thought experiment, your engine is on the starter box warming up, you are revving it up and letting it idle then revving it up over and over, what do you think your clutch bell bearings are doing in this situation? When you apply the brakes and let the engine idle, what is the bearing doing now? Bearing speed = Engine RPM – Wheel RPM. Hopefully that has got you thinking about the extreme conditions that a clutch bell bearing endures during simple operation, but there is more to the story. One of the most brutal aspects of wear in a Clutch Bell Bearing is Ball Skidding, this is when the acceleration of the bearing causes the balls to skid rather than spin. Under extreme acceleration in cases such as hitting the brakes at 30,000+ RPM. The bearing goes from stand still to high RPM instantly, the balls are unable to rotate at the same speed as the acceleration of the inner ring and the balls skid along the inner ring. This wears both the balls and the rings causing imperfections and premature wear, a bearing with poor tolerances is more susceptible to ball skidding. 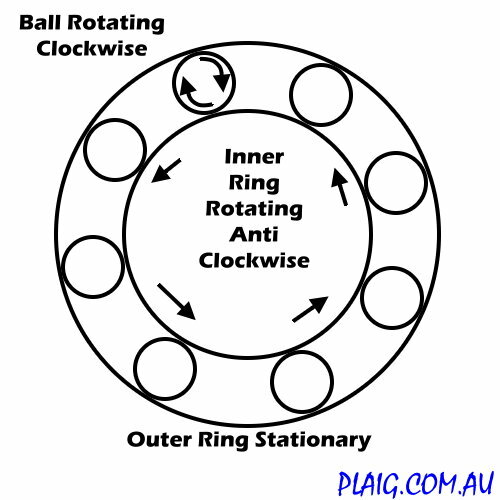 As you can see from the diagram below, the balls spin in the opposite direction to the inner ring, if the inner and outer ring are constantly accelerating and stopping at different times in different directions, the balls won’t be able to keep up and will be skidding along either ring rather than rolling with the rings. Once again the violent acceleration of a clutch bell bearing causes Lubricant Dispersion, It’s a bit like a dog shaking violently when its wet to dry off. Each ball is spinning individually as shown in the diagram above, this causes the lubricant to be dispersed from around the ball to the outer regions away from the balls. This happens very quickly when a bearing is freshly greased and this is the reason why our bearings are greased rather than oiled, it’s harder to disperse grease than it is to disperse oil. Heat also plays a big part in this choice as mentioned below. Yet another way in which Clutch Bell Bearings are abused far more than other bearings, a Nitro Engine is happy to operate at over 100c, add the heat produced by the constant friction of the clutch, the temperature of the bearings during peak operating temps could be anyone’s guess. 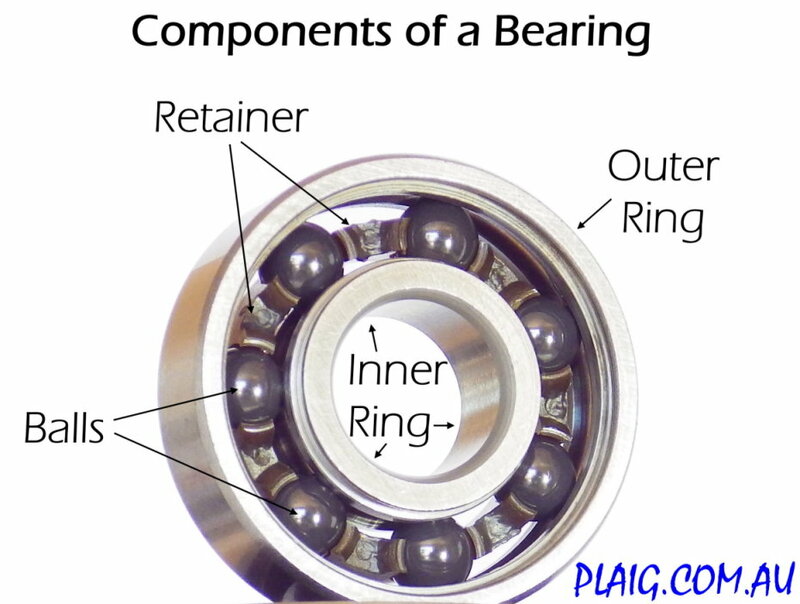 The Bearing is obviously made of steel and steel expands when it is hot, the balls will expand within the retainer and they will expand to increase the contact with the rings. Therefore a cold bearing will have looser tolerances than a hot bearing. This can at times stretch and deform the retainer depending on the tolerances within the bearing. The heat can thin out the grease / oil causing it to disperse easily from the balls and potentially leak out of the seals / shields. Oiling a clutch bell bearing because it spins more freely in your hand, is not helpful in a clutch bell bearing!. It is going to spin regardless, you just want to lubricate it as best as possible. As seen in the diagram, Axial Load is when the force upon the ball is diagonal. The inner ring is not inline with the outer ring. This type of load may occur if a bell has been shimmed up too tight. 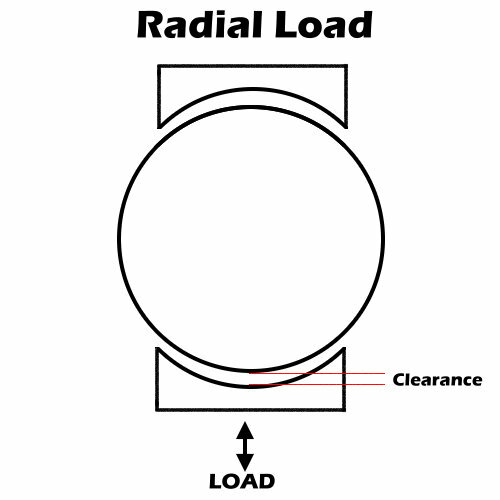 As seen in the diagram, Radial load is a force directly down onto the balls, this occurs when a bell is meshed tightly. Radial Load may increase or decrease with Chassis flex, putting strain on all parts of the bearing including the seal / shield. Chassis flex is not always something that can be prevented but it is definitely another reason why clutch bell bearings receive more abuse than other bearings. As mentioned in the beginning, a wheel bearings outer ring is stationary within a hub. A clutch Bell bearing is stationary within the clutch bell, but the bell itself spins therefore there are centrifugal forces on all parts of the bearing. The individual balls are being forced outwards, putting strain on the outer ring and retainer, the amount of G-Force at 30,000 RPM is extreme, you only have to see tyre’s deforming when free revving off the ground to witness this, and don’t forget that is only 8% the speed of the clutch bell. Our Premium Clutch Bell Bearings all come with Metal Shields, there are a few simple reasons why rubber sealed bearings are not as good in clutch bells, and our testing over the years has proven the theory. Rubber Seals contact both the inner and outer ring to create a seal, this is great for wheel and diff bearings, keeping dust and dirt out is more important than high RPM’s, wheel bearings require durability. 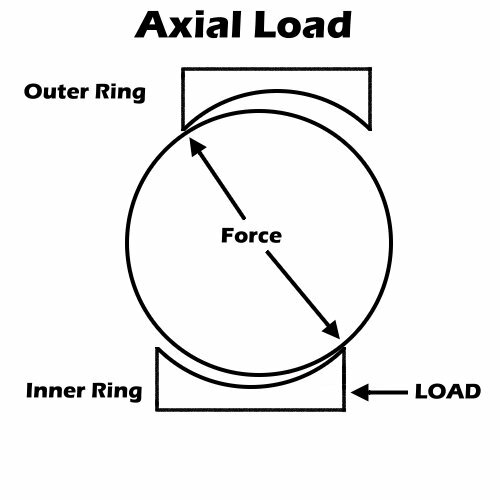 Going back to our diagram of Axial Loads, you can see that the inner ring can move a small degree in a diagonal direction, this is the main cause of rubber seals coming free from a bearing. This was the biggest problem that we experienced when using rubber seals. The seal is contacting both rings which are moving at different rates at different times and under extreme acceleration. As seen above, a rubber seal is a flat washer with rubber moulded onto the front face, the only thing keeping the seal attached to the bearing is the rubber that protrudes past the washer. Rubber Seals are easily removed and easily popped back in. For a clutch bearing, this is not such a great thing. Metal shields however are held in with a circlip and the inner ring does not touch the shield. Therefore the bearing can spin more freely without contacting a rubber seal. If you can imagine a bearing under axial and radial loads, chassis flex, extreme acceleration and stopping, rubber seals will continually contact the inner ring, your seal can be prematurely dislodged. Our testing and the feedback from our drivers and customers, have all pointed to a great improvement in switching to Metal Shields, our Premium Bearings give you some warning before a failure. Rather than the bearing collapsing, the first sign to change bearings is that the metal shield will come dislodged. This is an indication that there is wear which is causing more Axial Movement and has dislodged a shield, if there are signs of this after very little run time, you may need to remove a shim from the bell. It may feel loose when the engine is cold but when warmed the free play is helpful. 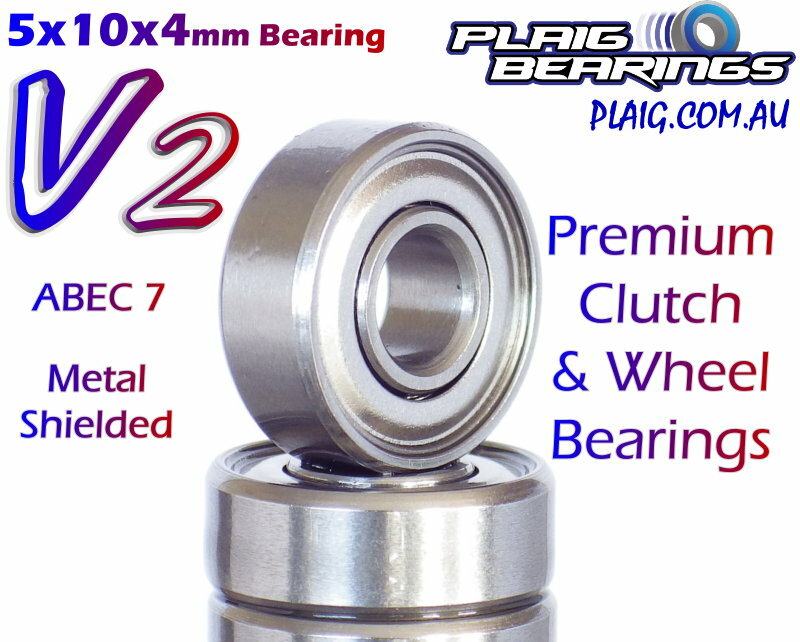 Taking all of this into account, we have released our V2 Premium Clutch Bell Bearings which can be purchased HERE. These have been tested by our drivers and are continuing to be used every weekend, the main improvement is the tolerances within the balls themselves and the rings, they are an ABEC 7 rated bearing, this means the balls are made to higher specs with less chance of a ball being out of shape. The rings are made to higher specs to ensure the bearing has less Axial and Radial Play. Lighter – The balls are lighter, this equates to less centrifugal force and less wear due to less rotating mass. Harder – Ceramic Balls are harder than steel balls, they will not wear as easily and will handle ball skidding better. Heat Resistance – Ceramic balls do not expand like steel balls when hot, they will maintain their size at operating temperature. 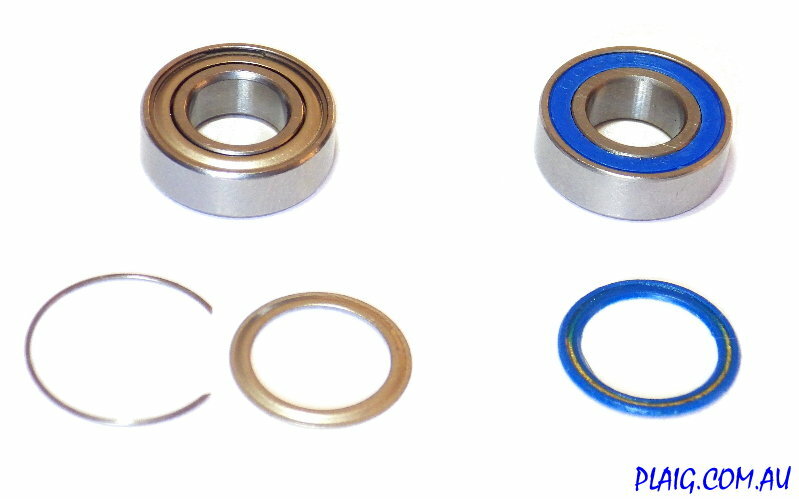 Ceramic Bearings still rely on the rings and retainer which will wear depending on the application. Overall they are a better option, but it comes down to budget and maintenance. You may believe that you can just leave ceramics in and run them for a long period, but this could lead to neglecting other maintenance such as clutch inspections and general checking of engine screws, exhaust gaskets etc. My personal view is that good quality steel bearings such as our new V2 Premiums will give you the required reliability, with the affordability of being able to change them at regular intervals.